I'm back again with another Lawn Fawn Inspiration Week post. 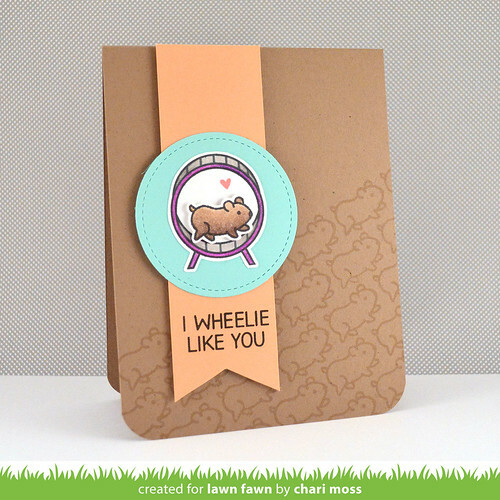 Today I'm sharing a project featuring the fun mini set Wheelie Like You. The images are colored with colored pencils and layered over a stitched circle die cut. The hampster army in the background is satmped with toffee crunch ink on kraft cardstock for a tone on tone pattern. Stop by the Lawn Fawn blog for more projects with this fun little set. Thanks for stopping by today! 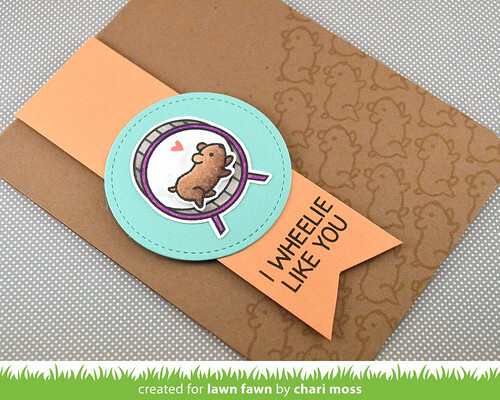 I just love this card, Chari! Your stamped background really makes this card special. The background with all the hamsters is amazing! & love the colors you used together. So very cute!! LOL. I love all of the little hamsters "running" along in the background. Great idea, Chari.